What prompted this issue for me was a race in the rain where I couldn’t see anything but gray until folks put their brake lights on. MidAtl now has a requirement for working taillights, or a dedicated bright taillight. Imo tho, having your taillights working is much better than a single dedicated light because the two lights, a known distance apart, give your brain depth perception info that one light doesn’t do. When you see one light in the distance with no reference points, the brain has no idea of the distance, no idea at all. Note that MidAtl has explicity told us that our OEM tailights are not bright enough to meet their rainlight requirement. So altho they’re not telling you what to do, you do need to do “something”. Wiring in taillights. Open up the wiring harness on the driver’s side of your trunk. Find the white w/ green stripe wire and the white w/ blue stripe wire. One of those goes to the left rear and one to the right rear taillight. 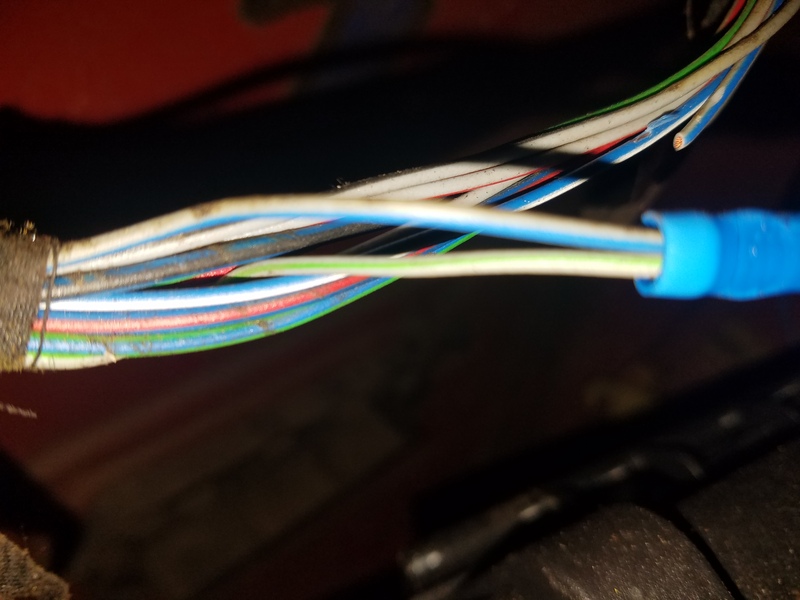 With some work, you should also be able find them in the wiring harness by the driver’s side rocker panel, but in my case the wiring colors were so faded there that I had a hard time. Your dash switch needs to send 12V to both those wires.